Christmas is barely over, and already Kevin Garnett may be headlining the naughty list for 2014. 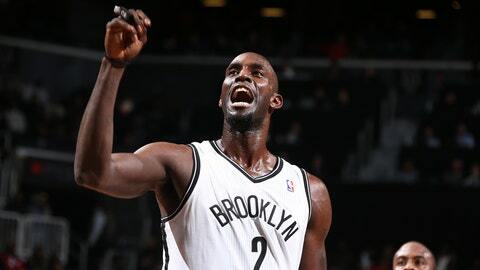 During Wednesday’s blowout loss to the Chicago Bulls, KG did what KG does when a call doesn’t go his way. The trash-talking star spewed a few choice words to a referee during the first quarter of the Christmas Day matinee right in front of a young fan who was sitting courtside. The little tyke didn’t have much time to expand his vocabulary, however, as the young man next to him quickly covered the boy’s ears to shield him from Garnett’s colorful language. Given the stunned look on the young boy’s face, though, he may have heard more than he would’ve liked, and we’re just guessing that Garnett didn’t call the ref a cotton-headed ninny-muggins. Check out the protective older boy doing all he can in the video below.